Hey everyone, I’m back. I got married last Saturday, which means huge changes for “About Last Night.” I’m an official adult now, and I realized that some of my material is immature and inappropriate. It’s time to clean up my act and become a lot more conservative and family-friendly with my humor. That way, everyone can enjoy a good hearty chuckle in the morning. But it’s only fair to give you a “transition day” to help you prepare. In the items below, I’ll use an example of “old humor” after the link, and then show you what the new, more adult jokes will be like in bold. Tomorrow, the old humor will be gone for good. 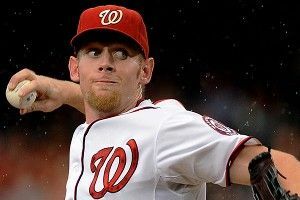 Stephen Strasburg earned his 15th win with 10 strikeouts over six dominant innings as the Nationals beat the Braves 4-1. He also threw to second base 98 times, mostly when there was no runner on base. “If I throw to second, that’s backward, so it takes away a pitch to home,” explained Strasburg, holding a calculator. “If I do that enough, it takes away whole innings, and then I stay below the innings limit and can pitch in the playoffs.” A closer look at the calculator revealed that it contained no batteries, and several of the buttons were either missing or covered with teeth marks. NEW: Boy, if Strasburg blew any more smoke, he’d be a danged politician! NEW: This just proves what I’ve always said — that danged Nunez is nothing but a yahoo! NEW: If he pitches well, maybe Clemens can win a danged Cy OLD Award! NEW: Looks like the Eagle has landed — on his danged BE-HIND! Reds prospect Billy Hamilton, 21, set a minor league record with his 146th stolen base of the season. Now he’ll have a chance to set the all-time steals record, set by Darryl Strawberry in 1982 when he stole 174 bags of baking soda from the team kitchen before returning 173 of them in frustration. NEW: With that many steals, I don’t know if we should send this guy to the majors or the danged penitentiary! NEW: Influencing the author? I don’t care who you are, that’s a danged Pater-NO-NO. NEW: When it comes to Kevin, the Yankees all say one danged thing: You Kill Us! Seahawks coach Pete Carroll announced that rookie quarterback Russell Wilson will start in the team’s third preseason game this Friday. Tarvaris Jackson and Matt Flynn went to Carroll to complain about the decision, but accidentally boarded a bus to Vancouver and were detained at the border for 14 hours when they wouldn’t stop screaming, “TAKE ME TO PETE!” to customs officials. NEW: Wilson? Just don’t tell Tom Hanks, or he’ll paint a danged face on him and lose him in the ocean!